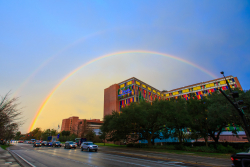 The University of Florida Health Shands Children’s Hospital once again ranked among the nation’s best pediatric hospitals in six medical specialties for 2018-19, moving even higher in pediatric cardiology and heart surgery and in pulmonology, according to the Best Children’s Hospitals rankings released today by U.S. News & World Report. Additional rankings included pulmonology, which moved up 11 spots from last year to 22nd, also a historically high ranking. The other ranked specialties were diabetes and endocrinology (27nd), neonatology (39th), cancer (49th) and neurology and neurosurgery (50th). The hospital’s pediatric cardiology and heart surgery program was the highest-rated in Florida for the third consecutive year. Also ranked highest in Florida were pulmonology, and diabetes and endocrinology. Mark Bleiweis, M.D., the director of the UF Congenital Heart Center and the chief of congenital cardiothoracic surgery, said it was a great honor to once again see the pediatric cardiology and heart surgery program recognized for its excellence. “It has been a multidisciplinary team effort as we have expanded the pediatric pulmonary subspecialty areas,” he said. “These include tracheostomy and chronic ventilator care, neuromuscular disorders, interstitial lung disease and sickle cell disease, among others. Additionally, there is a severe asthma clinic, and the pediatric lung transplant program has expanded and is Florida’s busiest. “The program has solidified and come together quite significantly and we have an increased volume of patients both inpatient and outpatient as the referrals come to our programs because our outstanding care is recognized," Light said. Ed Jimenez, chief executive office of UF Health Shands, said these rankings show a pediatric hospital performing on all cylinders. The rankings, online at https://health.usnews.com/best-hospitals/pediatric-rankings, will be published in the U.S. News & World Report’s “Best Hospitals 2018” guidebook, available on newsstands in September. Adult hospital rankings will be released later this summer. Last year, UF Health Shands ranked in more adult and pediatric specialties than any other hospital in Florida for the third year in a row — a total of 12.